Our celebration for New Year's Eve consisted of fixing the latest iteration of healthy pizzas and having a movie marathon with one friend. We've been working on perfecting our healthier, low-fat, low-sodium pizzas. After trying four sauce recipes I've found one that we like a lot, and we've settled on a whole-wheat crust recipe. Of course Om still likes meat toppings, and I want my veggies, but that's what mini-pizzas are for! If we rinse the fried, crumbled sausage or hamburger, the same way I do before dehydrating it for backpacking, it reduces the fat a lot. Low-fat cheese tops it all. There is something not quite right yet... maybe just that craving for MORE cheese, but they are pretty close. And they sure are better than no pizza. We've cut the size once too. Now they are down to about 6" diameter, and although it depends on the toppings one individual pizza is about 450 calories. Not bad! Oh yeah, we had big fluffy snowflakes yesterday. It was very pretty, but when I take pictures of some of these things that I like they seem to all look pretty much alike. So I pictured the pizzas! This is great! I couldn't catch a picture because I was on the phone, but here's the rest of the story. This morning a flock of crows descended on the yard. They marched around eating all those caterpillars. How's that for a great recycling story? 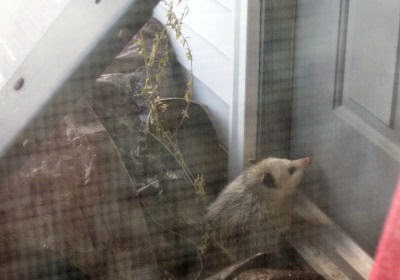 The strange weather this weekend resulted in the awakening of several kinds of wildlife. 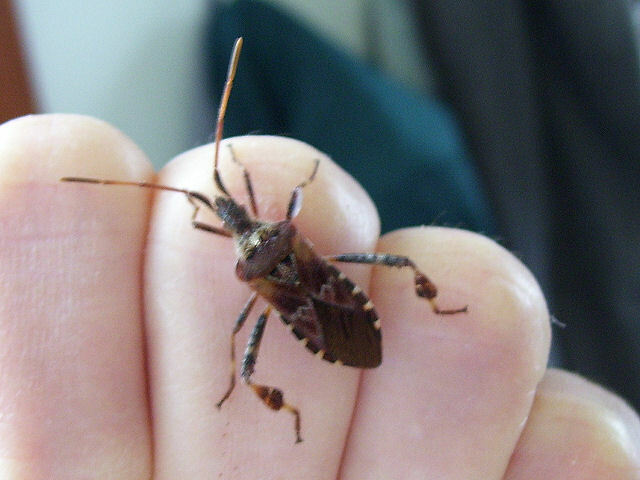 As I mentioned previously in Leptoglossus occidentalis, indoors we've had fruit flies, black flies, Asian ladybugs, spiders, and the leaffooted bug. 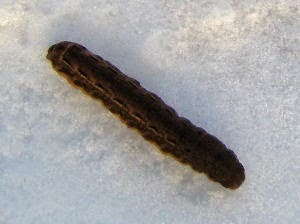 As I was coming across the yard yesterday I realized that there were several hundred of these caterpillars on top of the snow. Some were crawling along, like this one, while others were curled... not dead, but definitely slowed by the return of chilly air after Saturday's temperatures in the 50s. So it took me an extra day to be sure of the identification on these. They looked something like army worms, but they are darker than I expected, and the three lines that are usually prominent on army worms didn't show much at all till I caught the caterpillar in the harsh light of the camera's flash. 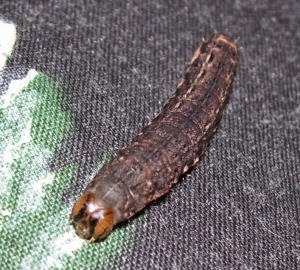 I sent the picture off to someone who knows a lot more about these things than I do, Bill Oehlke, and he confirmed the armyworm (or perhaps some other cutworm) theory. At any rate, these are not some gorgeous butterfly larvae that will now be decimated for having awakened too early. Armyworms are serious pests of grasses-- read cereal grains and corn. They turn into drab "miller" moths. As part of their life cycle the caterpillars overwinter just beneath the surface of the ground, and emerge in the spring to begin feeding on vegetation. Well, they got a surprise! Before they even discovered that the vegetation was not forthcoming they got blasted back into winter. 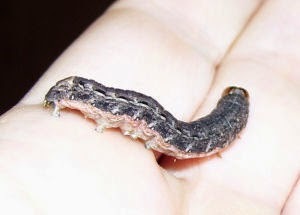 Oh, and "armyworm?" They received this name because of their practice of crawling in long lined masses of worms to find food when they emerge from the ground. I'm not a fan of seeing critters dying in droves, but I don't think these are the good guys, so I'm trying to ignore the carnage outside the kitchen door. It's hard to believe how cheerful a few glimpses of that big, bright ball of fire in the sky can make one after days... weeks.... without seeing it. Just seeing shadows spreading beneath the gnarly sumac trees was inspiring. Today was one of the oddest winter days in my memory. It's even been on the national news. We've gone from about 3 feet of snow on the ground to only a few inches. 55-degree temps and steady rain made for heavy fog, perpetual slop, and the awakening of quite a few insects in the kitchen! The Asian Ladybugs (of course, but they are pretty boring), the fruit flies, the larger black flies (but not the biting northwoods kind), and the leaf-footed bugs that show up occasionally. So I think the leaf-footed bugs are interesting. And they don't bite. I usually just throw them outside. But today I decided to find out more about them and tell you! Actually these are only related to the Eastern Leaffooted bug. 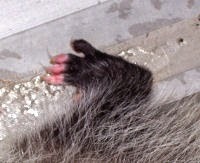 (so called because of that leaf-like widening of the hind legs). Mine, L. occidentalis, came from the west, to the southeast, and has now spread to the Great Lakes region. It likes to overwinter in buildings, which is why many people see them (like me). 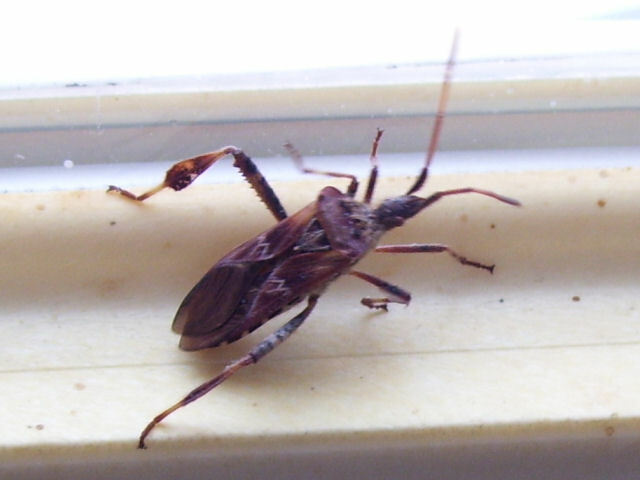 This one's common name is actually Western conifer-seed bug. They have piercing-sucking mouthparts and feed on sap from green cones, twigs, seed pulp, and sometimes needles of several species of pine, plus hemlock, spruce, and Douglas-fir. They do not bite people or carry diseases. Supposedly they can give off an unpleasant odor when handled, but I've been picking them up for years and haven't experienced this. They don't reproduce inside (well, unless you have a live conifer tree, I suppose). They sort of buzz when they fly. 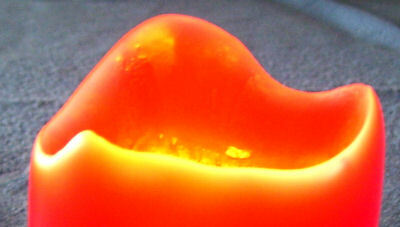 This season I put the red candle on a higher surface, and it presented me with a new perspective. The dogbone tree did get decorated, and actually ended up looking pretty good. We had a quiet morning and spent the rest of the day with friends. We realized, mid-afternoon, that this is the first year that we've gone anywhere on Christmas. It's always been a family day for us. But with none of the boys home this year we accepted invitations to visit with others. Lots of music and some games. Quite a change, but it worked out just fine. Hoping yours was special in some ways too! This is the kind of thing I've been seeing a lot of lately. Just ran the snowblower for the 13th time this year. Only did 12 runs all last winter. Coming up on an oil change. The landscape was completely changed from last night. The wind had shifted to a new direction. The next two pictures are how the camera sees the snowblower's output. I don't have any pictures to go with this post, and it will be for the past two days. I had to run the snowblower twice in 12 hours so that Om could get out and in to do the paper route. We just let the storm do its thing after he got in Sunday morning. But then I went out at 1:30 am today to open the driveway. It was amazing and eerie. I should have gone in to get the camera, but it was so cold, and I really just wanted to concentrate on the job at hand. For almost the entire length of the driveway (400 feet) the snow was deeper than the scoop of our very large, 10 HP blower. It was sculpted into waves in places that don't usually drift, so I know that the wind was a little different from usual. But it's a great blower, and soon I was plowing a straight-sided ditch through the rolling blue landscape. The shadows in the harsh headlight were deceiving. 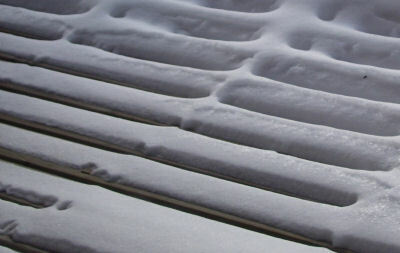 In two places, for no apparent reason, there were sculpted holes with embossed lines pocked into the snow. It was as if some elephant on a flying magic sled had crashed into the drift and then caromed off again into the night. 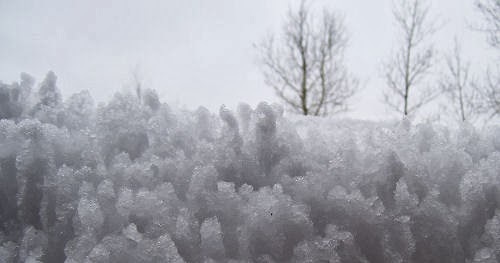 Most bizarre of all, just below the shed a sharply peaked drift had piled up to a height of over 4 feet across the drive. I took a couple of passes at it and cut my "ditch" through. But each time I went by that location the squared-off end of that ridge loomed at me, bouncing the light back in my face. The newscast tonight stated that we have 30" of snow on the ground, with over 70 inches falling so far just in December. Another storm is supposed to hit on Christmas Eve with another 4-7 inches! Maggie and I went for a short snowshoe walk this afternoon. But it took 30 minutes just to do the shortest of my trail loops. The snow is so soft and fluffy that I sunk deeply even with the shoes. No sun all day. You know I just love seeing the tracks from my treks in the snow! Yesterday Joan M. (yes, another Joan) and I went for a walk after our big dinner. I wore the skis and she used the snowshoes. We walked side by side, and so instead of one lovely track, there were two graceful parallel ones highlighted by the morning sun to greet me when I looked out the kitchen window. A symbol of friendship, written in snow. The day began before dawn for me to get the turkey in the oven. I didn't realize it was snowing outside. I was trying to take a picture of the very blue dawn light. 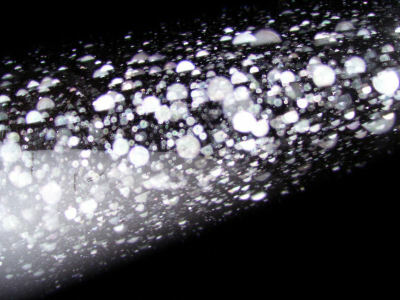 But the camera captured the snowflakes in the flash, looking like comets! By mid-afternoon thirteen of us were sitting down to a table full of food. Everyone seemed to enjoy it. Omer was happy with meat and cranberry sauce. The youngest, Matthew, grazed his way through the pickles and grape tomatoes. For sure no one went hungry. People moved along to playing with the Lionel trains, watching videos, sledding and then dessert. Sean played his penny whistle, Verily wanted to learn how to knit, so we took a stab at that. Lots of activity followed by pumpkin bars and Knox Blox. Well, I sure learned something new these past few days. I've been writing an article about keeping home aquariums. When I was a kid I killed a fair number of goldfish, trying to keep them happy. In retrospect they probably succumbed to the chemistry of our well water. But I've often considered setting up an aquarium. The first time I saw a salt water tank with corals and anemones I was mighty impressed. The colors were stunning, the movement and interactions of the organisms was interesting. Of course it was expensive. So now I know a whole lot more about the amount of work it would take to actually keep any kind of aquarium. I suspect that in the long run I wouldn't get enough enjoyment out of watching the fish to make me do the maintenance. But it's interesting to know. From her perspective I suppose she felt like she was just being yelled at all day. First of all, she still keeps trying to nip snacks from the dead deer in the back field while we go on our walks. I wouldn't mind so much if she didn't throw up all over the bed later in the day after these snacks. So she KNOWS she'll be called a "bad girl" and get no biscuit when she goes to visit the deer, but after about four false starts for the carcass, and coming back when called, she usually loses to temptation and slinks away from me. It's hard to chase her on skis. I'm pretty awkward! Then there's still Dandelion. 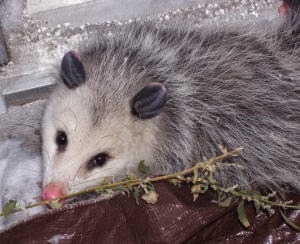 My little 'possum has taken up residence under the bench on the terrace. It's a wonderful hidey hole in a corner, protected by a tarp and a shovel. Good thing too, because Maggie keeps trying to poke her nose in where it's not welcome. And I keep yelling at her to get away from there! Finally, uncharacteristically, the cat was sleeping in Maggie's spot on the couch. Now, really, that was just too insulting! But poor V-8 is eighteen years old so I try to keep Maggie from chasing her. So until I could scoop up the kitty, Maggie got yelled at again! What's a curious dog to do when she gets told she's bad every time she wants to explore anything of interest? The rain has changed to snow, bitter cold, and windy, softening the new icy crust and flinging clots against the screens. 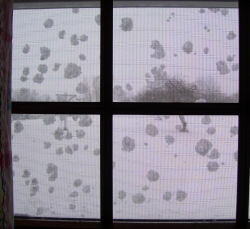 It was a day to remain snug and watch through the windows as the "snow devils" swirled. Rain all day, about half of the snow is gone. Around 2 pm I looked out and saw a strange miniature landscape. This morning was the monthly Spirit of the Woods hike. 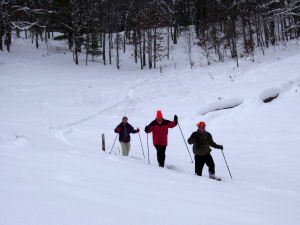 Four of us met at Bowman Lake- two skiers and two on snowshoes. I was planning for Maggie to come too, but she has decided to boycott outside walks in the deep snow. I dragged her off the couch to take her to the car, but the minute I let go of her she ran back to her comfortable spot. It was her loss! The snow was deep, but with four of us we beat down a nice path. We were out for two hours... just about right. Dandelion has explored around the house even more. She's huddled under the outside stairs tonight. Maggie is very interested in going outside just about every hour to see if she's still there . She doesn't think I'm very fair to keep yelling at her to stay away from the steps. 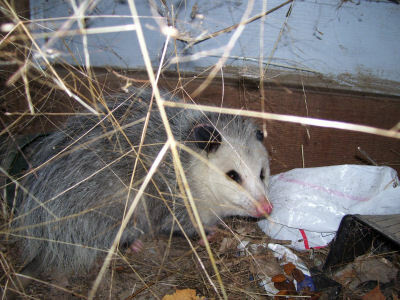 The little 'possum tracked all around the terrace looking into all the places that the mouse did the other day- under the wheelbarrow, beside the tractor, and under the bench. But she also came right up to the door and across the door mat. No tracks on the mat, so I can't tell if she sat and looked at the door like she did upstairs. I can't wait to see what she does next. Today I spent almost all my time working on writing assignments (for which I get paid). One of these is about beer... I know... not a topic I have a lot of background knowledge about. But here are three interesting word origins. I expect you may know the first one already, but it fits so well here that I will include it. The word "honeymoon" comes from the Teutonic custom of giving beer made from honey to newlyweds which they were to drink for a month after their wedding. The word "beer" itself comes from Middle English "ber(e)" which comes from Latin "bibere," to drink. We also get the word "imbibe" from the same root. Finally, and I just love this one, here's a contorted pathway leading to the naming of a lowly strain of yeast. The taxonomic name for the yeast commonly used for brewing beer is Saccharomyces cerevisiae. The species part "cerevisiae" comes from the Celtic word for beer. The Romans considered the Celts to be anyone living north of the Alps, thus barbarians. And the barbarians were associated with the drinking of beer, rather than wine. This was, in reality, mostly due to the climatological problem of growing grapes or other fruit in the northern latitudes. Wine was for the Mediterranean culture. Northern peoples fermented grain, ie. beer. So there we have one of the origins of the notion that beer drinkers have less social standing than wine drinkers. But look whose word for beer has been awarded to brewer's yeast! He who laughs last? 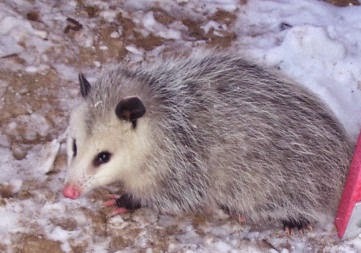 Remember a few days ago I saw a little opossum outside near the pines? Well she spent a couple of hours today much closer than that. I first noticed her waddling across the front porch. By the time I got the camera she was nosing around between the snowblower and the pantry door. You have to wonder what she was thinking! Of course I choose to think that she wanted to come in and spend the afternoon playing. Next she huddled down behind the snowblower. Best guess... it was a little bit warmer there by the door. I took a piece of carrot out and offered it to her. She took it, but she didn't eat it. I thought 'possums ate almost anything! With the deep snow, I am surprised that she wasn't hungry. I just looked up some information, and perhaps I should offer her some fruit or a little dog food (not ok for long-term feeding, but a snack should be ok). I wanted to move that weed for a better shot, but didn't want to spook her. Isn't that little foot just too cute? So of course, she now has a name. It's Dandelion. I wonder if she will hang around and/or survive until the dandelions bloom. We have been plunged into winter over the past week. There are now about two feet of snow on the ground. What's a little mouse to do? 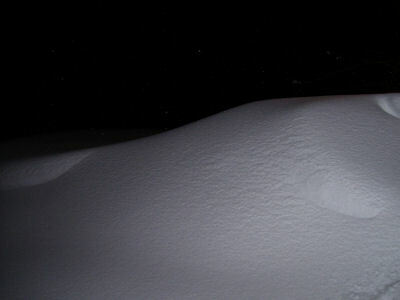 Well, this one ran all over the top of the drifts just beyond our terrace. It explored under the edge of the wheelbarrow, popped down beside the posts that support the deck, and took a detour under a bench. But where the snow was only a dusting at the edge of a drift these dear little prints with all the toes were found. I didn't post anything yesterday because I was just a little busy. I had entered the weekly contest on smallaa.com. They are a new social networking site, and they are spending their venture capital to entice users with a weekly contest that offers a significant prize. People had to vote for your post. I put up a link to the North Country Trail News and asked trail supporters (and anyone else I could think of) to vote for it. I pledged to give $1000 to the NCT if we won. I was either in the lead or very close all week, and spent yesterday making calls, sending more emails, and generally trying to get everyone and their cousins to vote. Well, it paid off, and I won! See smallaa So, $1000 will go to NCTA, $1000 to World Vision (they provide fantastic relief efforts around the world), and we will pay some bills and maybe have a treat or two. This isn't the kind of thing that I'm generally looking for to provide quality to my days, but I'm sure not unhappy! Praise God. We are treading softly until the check is actually in the bank, but I have turned in the paperwork, and have a UPS tracking number for the package. 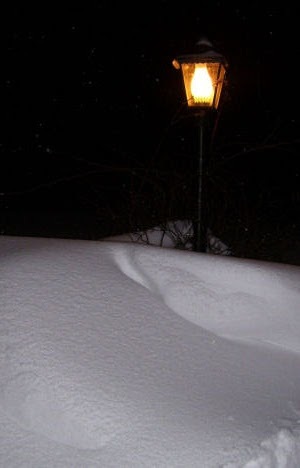 Here's how much snow we have. That's not a beached whale, it's the picnic table! 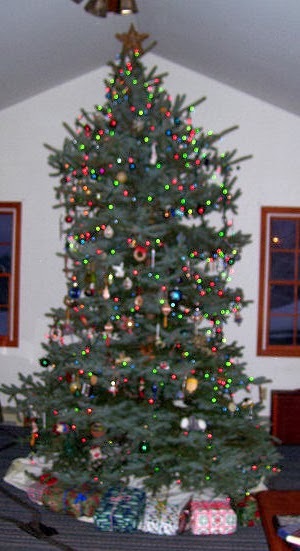 Here is the dogbone tree. Omer hasn't had time to decorate yet (that's his thing) but I see that it has developed cane shaped growths on some of the branches. Always good for a smile. Went to Crystal Valley with Ellen today, and we skied for two hours. 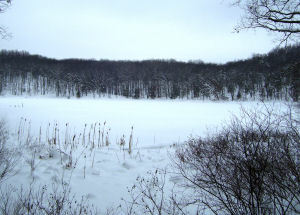 The woods was beautiful, and the snow so deep and fresh that all the sounds were muffled. And it was so cold that the shutter on my camera didn't open all the way. Made an interesting picture in a strange way. It was a cold and snowy day. The cold made the snow good for skiing, finally. One of the best parts about the first snow-covered days of the season is that I usually find a couple of small evergreens coming up in the back field that had been previously hidden in the weeds. 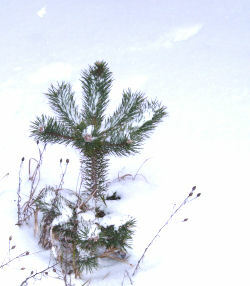 Here's a little Scotch pine coming up. These aren't my favorite, but it sure beats more autumn olive. I really treasure each little evergreen that appears in the field. I've planted about 20 white pine back there, and 5 of them are over 20 feet tall. Another 6 or 7 are big enough that they can actually be seen above the weeds in the summer. I just keep picturing it all as a forest and trimming back the berry bushes and weeds that try to choke them out. Several other volunteer pines, mostly Scotch, but a couple of red, and even one white that I didn't plant are holding their own. Horray! Oh yeah, we got a big tree too... the Christmas tree. Sean M. went with Omer to pick one up. We've found a place to get big ones really cheap. Of course that means that they have interesting shapes. This year's is sort of a dogbone.... I'll keep you posted.